We love the State of Israel. We want it to succeed in every way possible. This includes, of course, its security and economic prosperity, and it also includes its ability to live up to its own stated values. Israel’s Declaration of Independence ensures freedom of religion and conscience to all. This does and should affect many aspects of life in Israel, but the specific concern of this resolution is the right to marry. The overwhelming majority of Israeli Jews – 80% according to a recent poll — support freedom of choice in marriage. In this, Israelis are in accord with the rest of the world’s democracies, all of which make marriage possible through the alternatives of civil or various religious options for marriage. At the moment, in the State of Israel, the only avenue for legal marriage is religious. Civil marriage is not available to anyone, whether Jewish or non-Jewish. 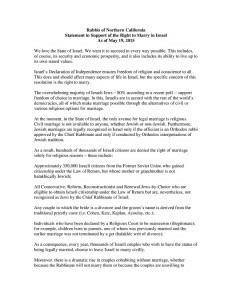 Furthermore, Jewish marriages are legally recognized in Israel only if the officiant is an Orthodox rabbi approved by the Chief Rabbinate and only if conducted by Orthodox interpretations of Jewish tradition. As a consequence, every year, thousands of Israeli couples who wish to have the status of being legally married, choose to leave Israel to marry civilly. Moreover, there is a dramatic rise in couples cohabiting without marriage, whether because the Rabbinate will not marry them or because the couples are unwilling to subject themselves to Orthodox, non-egalitarian strictures. Finally, the failure of Israel to provide for civil marriage and to recognize Jewish marriages under the auspices of rabbis from the other streams of Judaism has alienated many Diaspora Jews from the State of Israel precisely at a time when all Jews everywhere must unite in supporting the State of Israel against efforts to undermine its existence militarily and economically and to question its character as a democratic state. We, rabbis of Northern California and Northern Nevada, are committed to the spirit of respect for democratic values and civil liberties articulated in Israel’s own Declaration of Independence and in many of its laws; and we urge the government of the State of Israel to take immediate measures to create a mechanism for civil marriage in Israel and to recognize Jewish marriages within Israel by rabbis of all streams of Judaism. We believe that these measures will not only deepen respect for Jewish religious diversity and enhance the principles of democracy in Israel; but they will also strengthen the ties between Israel and world Jewry. Rabbi David Booth Palo Alto, CA. Rabbi Chaim Schneider, Santa Cruz, CA.